Monterey, Carmel, Big Sur and the surrounding area features some of the most dramatic and beautiful coastlines in the world. 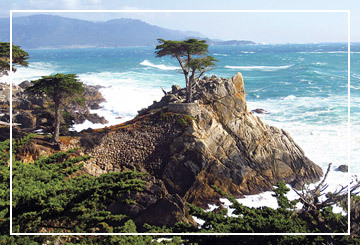 Attractions include the renowned Monterey Bay Aquarium and the famous 17-Mile Drive in Pebble Beach, home to spectacular and legendary golf courses. Excellent wineries, gourmet dining, cozy inns and elegant resorts are highlights of this gorgeous peninsula on the Pacific. Licensed California Seller of Travel #2116790-40 © 2019 Bay Magic Meetings & Tours, LLC. All rights reserved.